Lock in a great price for Ambiente Hotel & Restaurant – rated 8 by recent guests! It was very comfortable and cleam. Excelent brekafast! Wonderful breakfast. Great mix hot breakfast items as well as cold meats and cheeses. Set in a quiet atea staff were excellent and even did put oir laundry for us.. great breakfast. Really nice and clean. Good breakfast and nice staff. We arrived very late, but they waited for us. And gave hot water and etc. Very helpful staff! This is a hidden jem,if your traveling from Munich to Berlin and need a stop over after a hard night at the Hofbrauhause this is the place excellent rooms, comfortable beds,great restaurant. Run by lovely hard working people. Hotel is basic but great value. This is surely the best choice if you are on the way and don't want to overpay for hotel in Bayern. The hotel is very quiet and the beds are extremely comfortable. The rooms are nicely decorated and offer all facilities that you normally expect. The staff is always careful to make you feel at home. Late check-in and dogs are no trouble at all. The rooms offered by the Hotel & Restaurant Ambiente are minimalistic, yet cozy, with modern amenities including complimentary wireless internet access. Wake up to a rich breakfast buffet in the bright and welcoming breakfast room, which also has a conservatory. During warmer weather, sit on the terrace and enjoy the sun. Treat yourself to a relaxing massage, which can be arranged at the hotel. The center of town can be reached in 10 minutes by car. The surrounding hills and forests are ideal for walks and cycling. In the Plausen park you will find a small electric train, which takes children on a ride around the park. When would you like to stay at Ambiente Hotel & Restaurant? Cozily furnished room with a private bathroom. 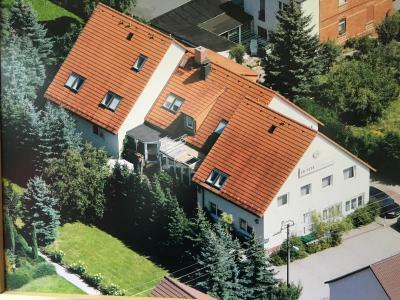 Our hotel is situated in the Vogtland district of the city of Plauen, surrounded by meadow and forest covered hills, and just a 10-minute walk from the lovely Neuteich lake. The rooms are cosy and intimate. Everyting is decorated in good taste. House Rules Ambiente Hotel & Restaurant takes special requests – add in the next step! Ambiente Hotel &amp; Restaurant accepts these cards and reserves the right to temporarily hold an amount prior to arrival. Ambiente Hotel & Restaurant accepts these cards and reserves the right to temporarily hold an amount prior to arrival. Parking near the hotel is a little limited. Wifi not always working great. I don't know what one could expect more. 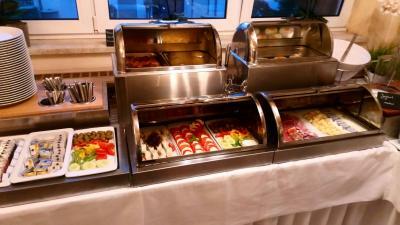 Great place, very quiet, nice staff, the mattress is very good, tasty breakfast. Please be careful with hotel's advertising that "free private parking is possible on site" (now they changed it to that "reservation is needed"). I had property's confirmation that I can park on site. However, hotel was busy during weekend and no parking place on site was available. I was offered to park in public place some 70-100 meters from the hotel, which was certainly not what was advertised and I had confirmation for. Far from highway when only passing. Slippery stairs. Great to have kettle in the room but no cups? Bedding is washed with something which does not agree with irritable skin.